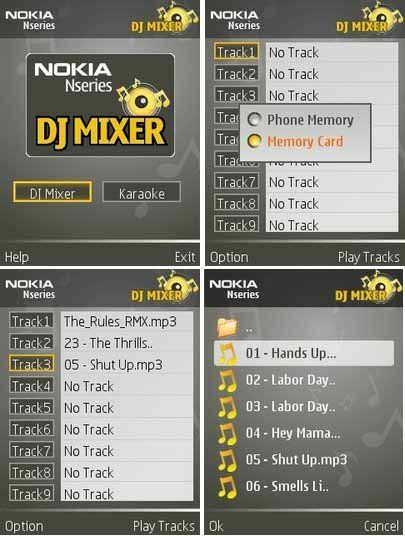 Free download Nokia DJ Mixer for Symbian. It is an application for Symbian devices which allows you to remix the songs according to your creative mind. You can give a new and better look to a song. It is an amazing app which you should use. This app is becoming more popular day by day. It is developed by Nokia itself. Nokia DJ Mixer is very light and easy to use app. It has very friendly mixer, you just send the song to mixer and then do your desired action on it. Every phone has MP3 player, it is very common now. But you can’t do DJ mixing on it, so Nokia DJ Mixer is here to complete your wish, you just need to load tracks in new playlist, you are done. Now mix that track and give it a new direction. Nokia DJ Mixer has a different mixing tool from Windows Audio Mixers, but still it has some potential to compete it and will give you chances to have a great fun to make and playing new tracks. Anyone can do this mixing it is not very difficult. It supports up to nine tracks at a time, you have to queue them, after one song is completed then go to next and so on. Nokia DJ Mixer has another interesting thing which is Karaoke option. It brings smiles on your faces. You have to upload and add the audio files of karaoke of your desired song then play this record and sing the song in your own voice. You can record this and save in your mobile device. You can also use samples of karaoke, create your own lyrics for that track and then sing it and create a new song. This one is the most fun feature of this app, isn’t it?